I’m the chairperson of the Art Therapy/Counseling program. 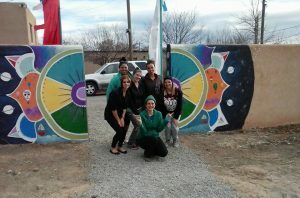 I moved to Santa Fe to teach at Southwestern College in 2002, and continue to be delighted by the insightful art therapy provided by our students during Practicum and Internship. It’s been an honor to witness our students as they blossom into therapists. And actually, I also find it so joyful to teach a little in the first part of their journeys because I get to gush about how much I love art therapy, to brand new students. I get to push them into falling in love with the work, or at least I hope that they will! 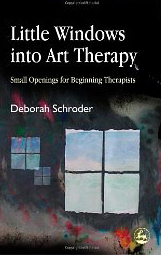 I’ve written two books that were actually born out of my classroom experiences here: Little Windows into Art Therapy: Small Openings for Beginning Therapists and Exploring and Developing the Use of Art-Based Genograms in Family of Origin Therapy. 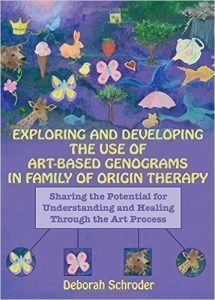 The recently published art-based genogram book includes images and words from students and faculty here. I purposefully worked with diverse clients in a wide range of settings over the years. I’ve enjoyed speaking about art therapy internationally and have presented in Northern Ireland, Greece, Portugal, England and Italy. My volunteer work currently includes serving on the New Mexico Counseling and Therapy Practice Board, and the Board of Directors for CASA (Court Appointed Special Advocates), First Judicial District. I’m an active member of the American Art Therapy Association and participate in committee work as needed. I have three grown children and two adorable grandchildren. Happily, my daughter and her boys live in Santa Fe so I get to see them, hug them, spoil them. 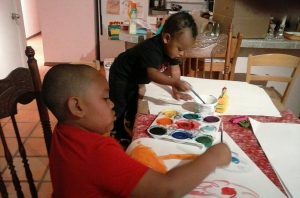 The little boys and I like to paint wildly, and we’re also pretty happy decorating cookies together. 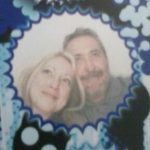 I have a wonderful partner who lives most of the week up in Truchas. When he’s not in town I spend time alone with my elderly cats who deeply understand my need for quiet time!